Ask and you shall receive! We have been asked for nearly a decade to build hardtails for Shovels, and now that these bikes are coming down in price we are getting the request more and more so here they are! We use OEM diameter DOM tubing top and bottom for a seamless joint at the weld points. We have built the rear transmission plate mounts into the hardtail section for better strength and to help with proper alignment as well as machined telescoping slugs at the weld points. At the top we tack weld in a cross member that also aids with alignment. 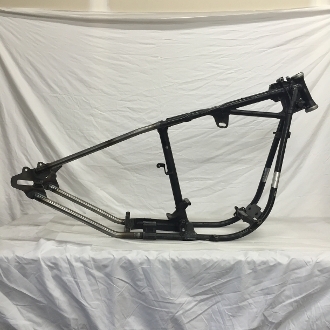 This can be welded in against the original frame casting as extra support, or can be removed once the frames have been tack welded together for more of an OEM look (like we did on the frame pictured. We did not polish the welds for the photos so you can see the fitment better) Machined dome endcaps for the tube ends at the axle plates, precision machined axle adjusters, transmission plate mounts and tightly coped tubing means a perfect fit before any welding is done. We meticulously TIG weld these entire frames in a fixture. They work with your stock axle and wheel spacers and will come with a brake tab for disc brakes. Fits swingarm frames through 1984.